Economic crisis, Billions for help and SYRIZA. That´s what Greece has become famous for within the last months. Because of this the country and the people, especially in the current situation, get in the background more and more. 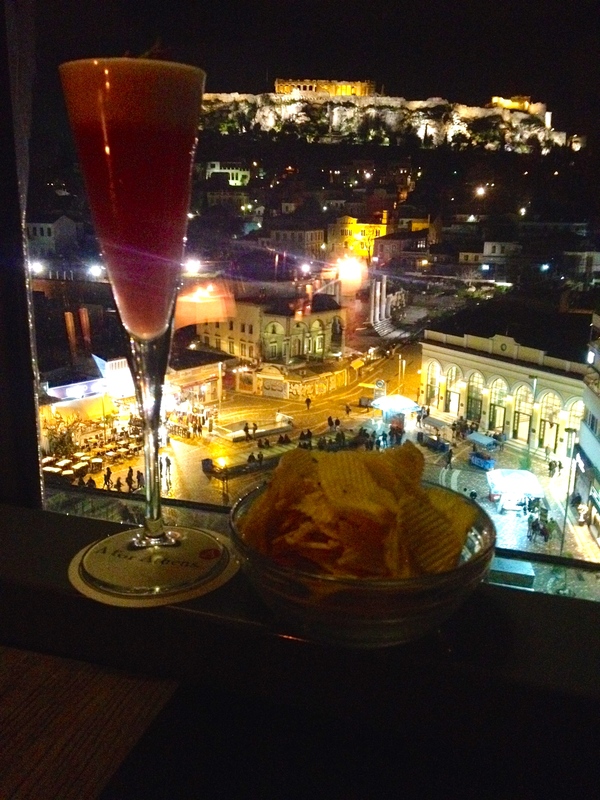 It´s a shame, because my mother has already raved about her stay in the Greek capital years ago. About the unique way of life, the impressive Acropolis and of course the delicious feta and olive oil. 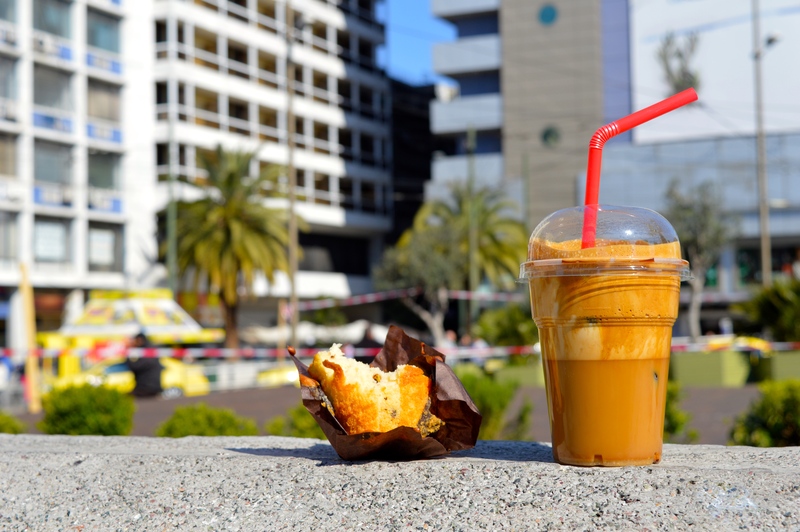 Drink Frappé and eat Gyros streetfood – pure greek lifestyle! 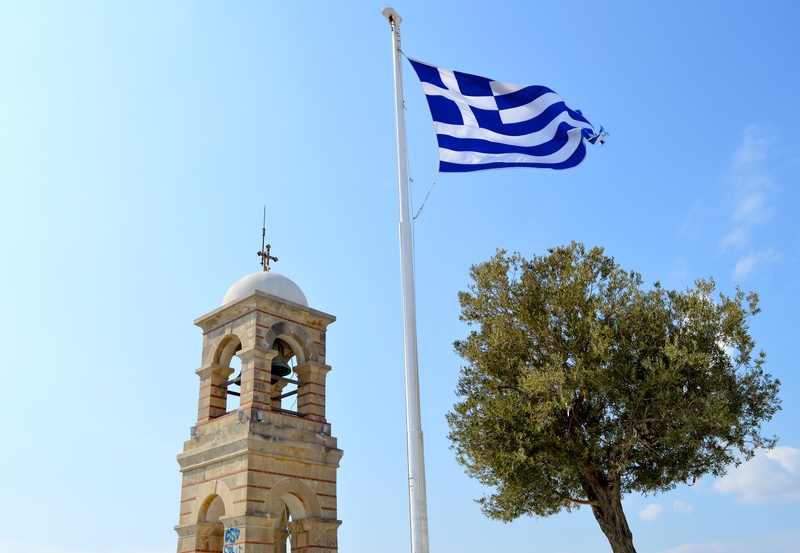 Climb up the Acropolis – impressive history first hand! 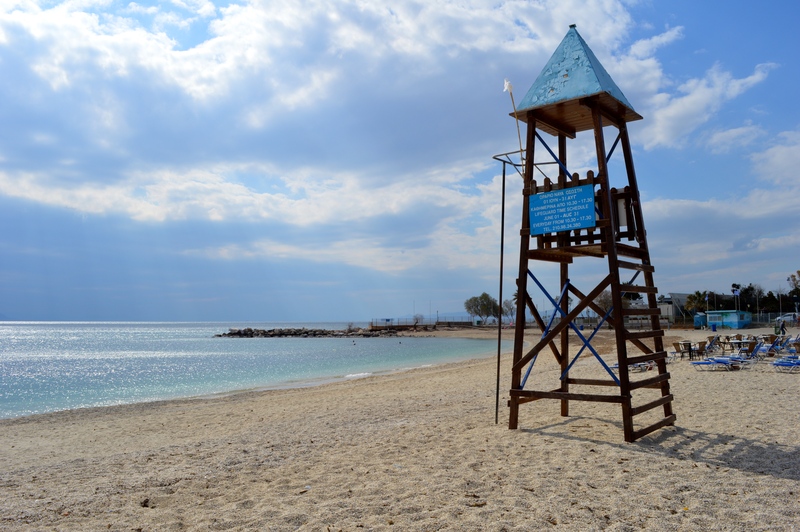 Go to the beach of Glyfada for a daytrip – switch off and relax! 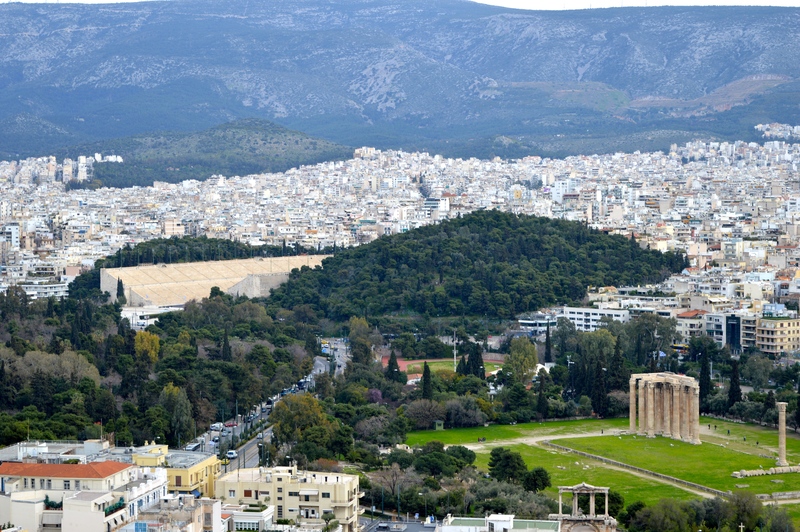 Marvel at the dimensions of Athens from the top of Mount Lycabettus – an unforgettable view! 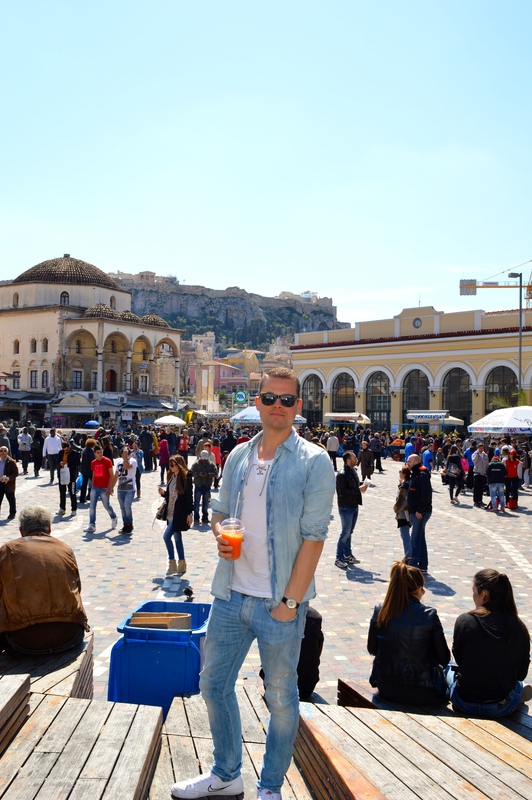 Walk along the marketplace of Athens – a real experience! The 5-day trip to Athens began at Munich Airport Terminal 2 on 16.03.2015. The approximately 2.5-hour flight was operated by Lufthansa with the Airbus A321 and went smoothly without any turbulences. This model, the same as to Lisbon and Fuerteventura, convinced with good legroom, even if u sometimes might have problems in Economy Class with a length of 186 cm. 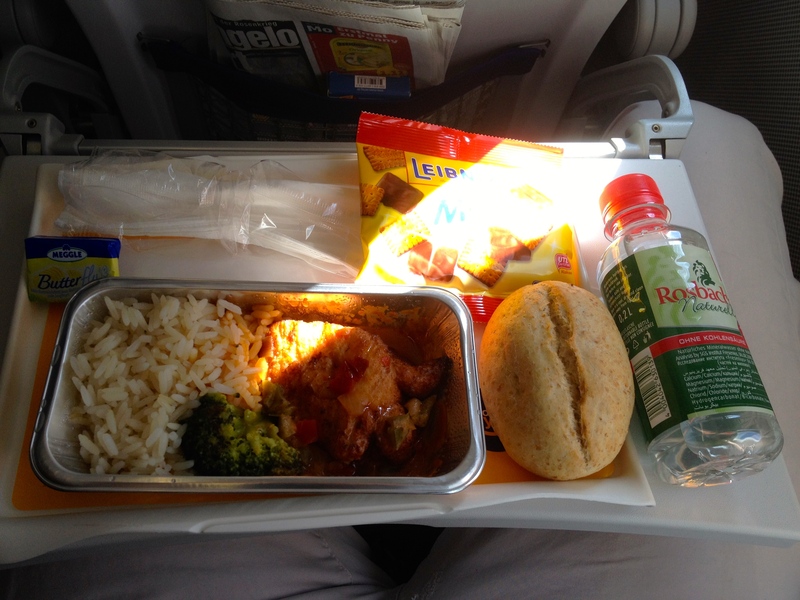 On the way there chicken with vegetables and rice was served, on the was back noodle casserole. Both were served hot and tasted really good! 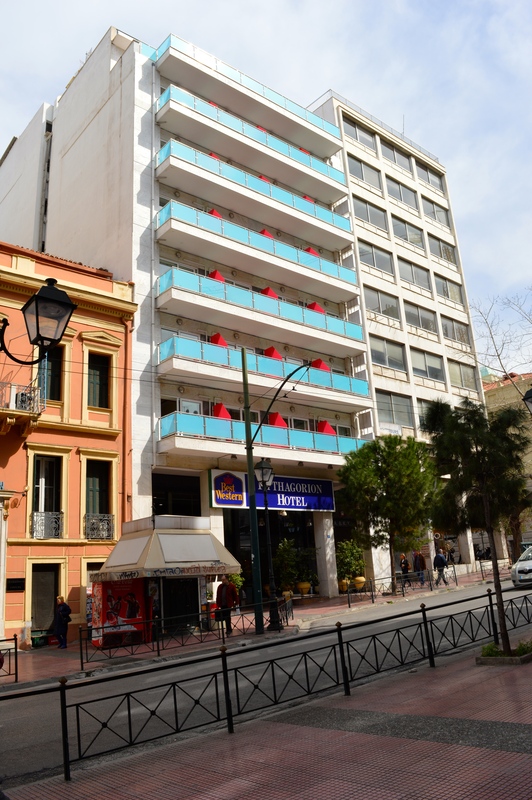 For the trip I chose the Best Western Pythagorion Hotel, close to Omonia Square. Particularly positive is the hotel´s location – ideal as a starting point for a city exploration. More information about the hotel, click here. 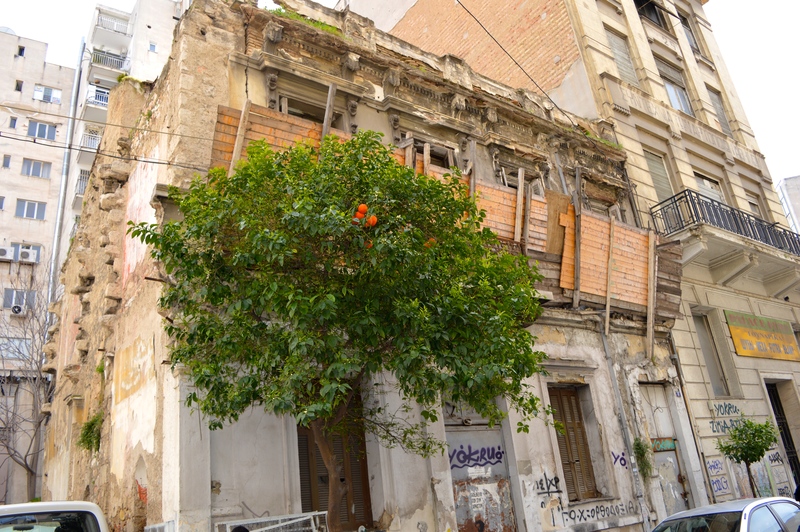 What I immediately noticed after arriving in Athens, were empty houses and ruins – even in the best city-locations. Elsewhere these houses would already have been sold and (luxury)renovated a long time ago. Here the owners still wait to sell their properties on economically better times. This was confirmed by many Athenians. On the one hand a pity, especially in the good city-locations and the sea. 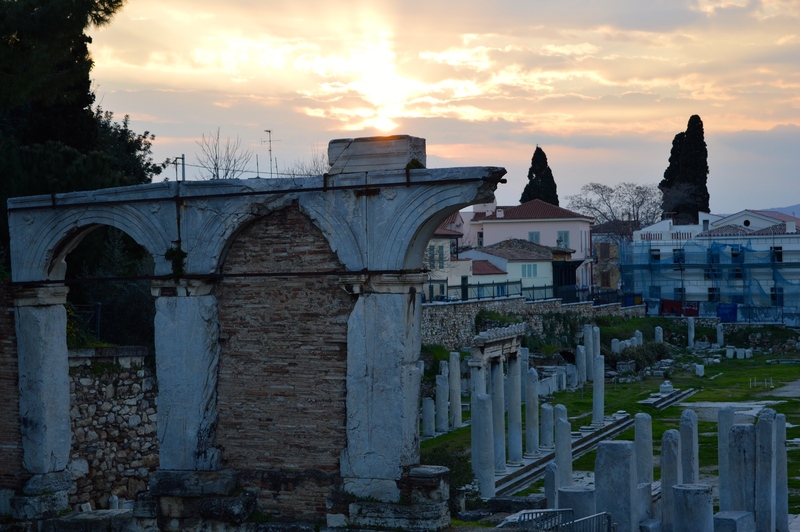 On the other hand, exactly this mixture of old and new creates the charm of Athens, which indeed takes place since ancient times throughout the city and so gives the city its own personal character. Speaking of taste… an absolute must, of course, is to drink the frappe, which has its origin in Greece. The instant coffee is foamed and cooled with ice cubes. It´s delicious strong taste fits nicely with the sweet temptations of countless bakeries. 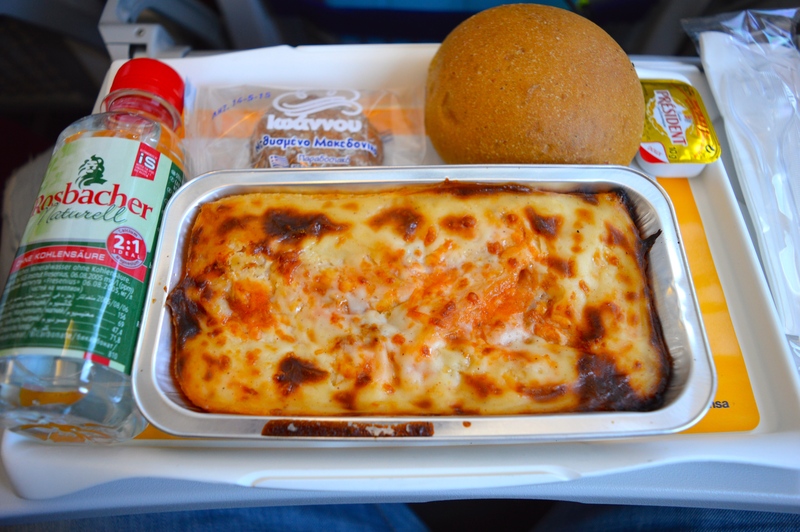 More about food in Athens, click here. Well fed, now the main sight of Athens can be climbed. Starting from Monastiraki square it takes about 30 minutes to reach the Acropolis and you have to pay 12 euros entrance fee. 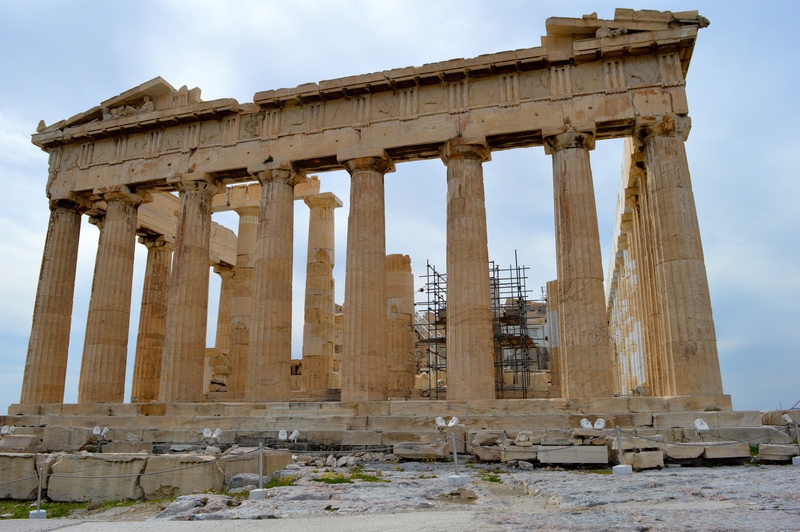 Its most famous temple is called Parthenon. 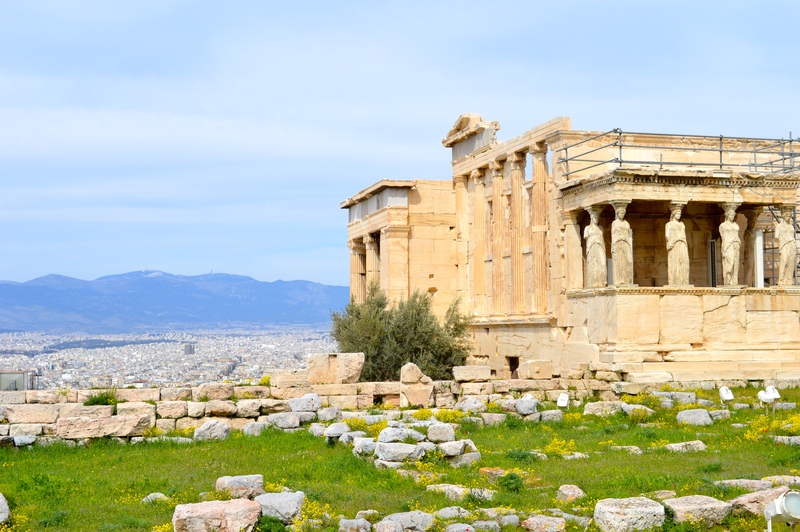 High above the city the sight of the 2,500 -year-old buildings of the Propylaea, the Erechtheion, the Temple of Nike and the Parthenon instantly let yourself almost feel humble. Ancient history almost close enough to touch. A barrier, about 10 meters from the buildings, prevents the visitors from them. Not only at the Erechtheion the Acropolis offers a beautiful view over the whole city. 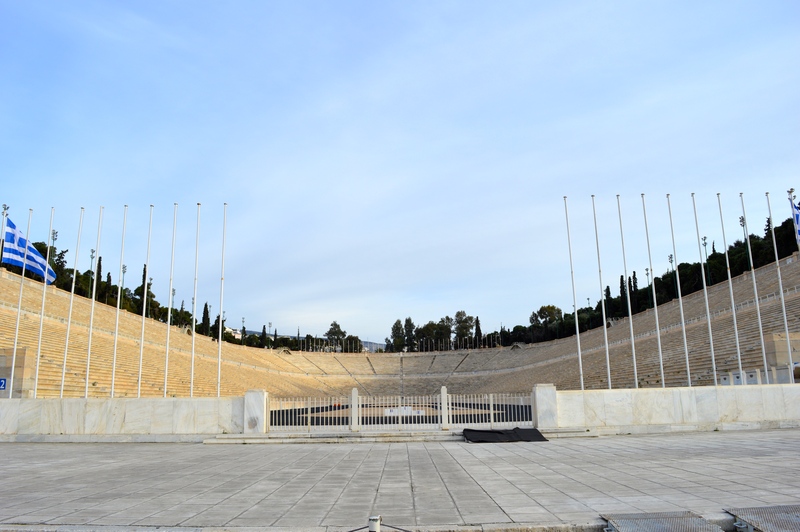 The view towards the east opens up a beautiful view, which includes not only the Temple of Zeus and the Panathinaiko Stadium. Here in 1896 the first Olympic Games of the modern era took place; it was built on the foundations of the stadium, on which in 330 b.C. the Olympic games of antiquity have been founded. 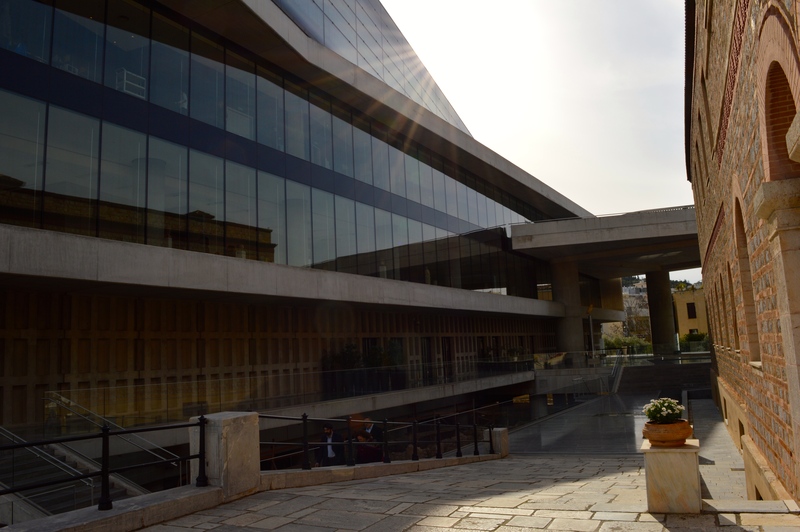 A 10-minutes walk away from the Acropolis, there is the new Acropolis Museum. The exact opposite is the New Acropolis Museum! Therefore, I can highly recommend every Athens visitors to invest five euros in the entrance ticket to see original finds from close range. Extraordinary nice is the Pantheton exhibition on the top floor. There, a small cinema is constructed in which a film is shown about the imposing structure. 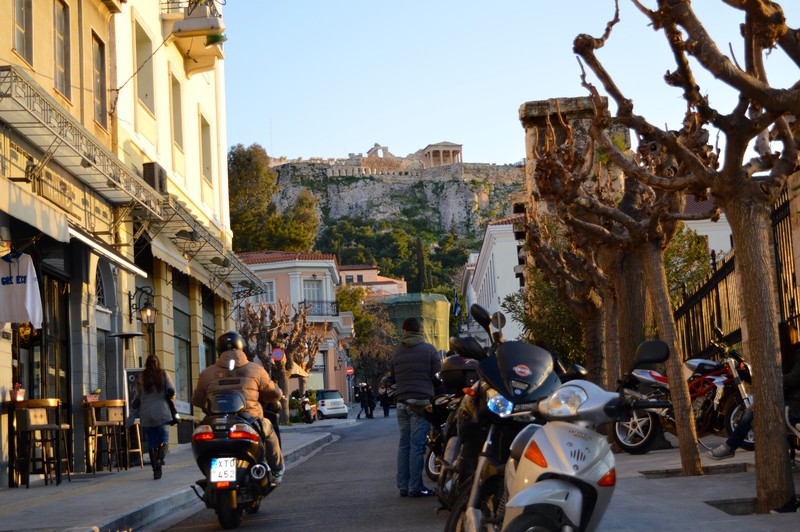 While walking through the district Plaka below the Acropolis you can stroll through souvinir shops and try some of the cute Cafés and restaurants. The prices there are moderate despite the tourist-oriented location and the quality of the food I tasted was consistantly good. It is night in Athens. And the city offers a completely different, very nice site. After the sun slowly disappeared behind the Acropolis, its whole rock is illuminated by countless lights. An elite unit of the Greek army, the Evzonen, protect the local Tomb of the Unknown Soldier, changing guards every hour. Like in Monaco, they keep a very straight face and take their job very seriously. From Syntagma square off in western direction, the Ermou Street begins, which is almost completely expanded into a pedestrian zone. Between countless shops of international brands and designers, you can also find small shops of local distributors that offer their goods unobtrusively. In the adjacent tracks, mostly restaurants and bars have settled. In one of them I was able to convince myself of its good quality. 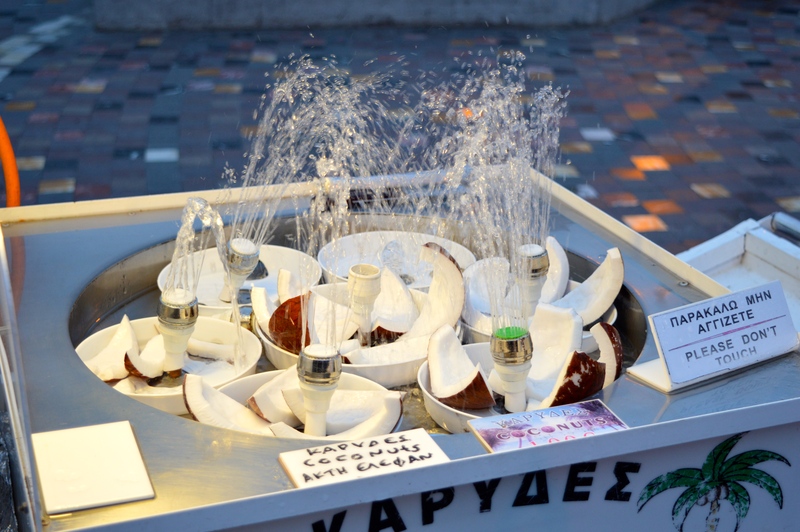 More about food in Athens, click here. In my opinion, it is another MUST to go in the southern district of Glyfada or Voula for one day. By tram no. 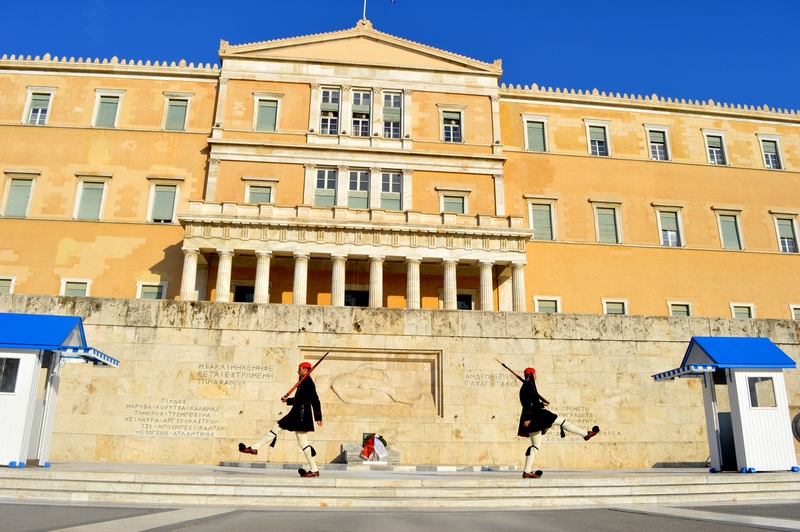 5 this beautiful piece of earth can be reached easily from Syntagma Square after about 45 minutes. Arrived at the sea, i can recommend to get out in Edem and walk through the near Marina, enjoying the incredible view of the Saronic Gulf. 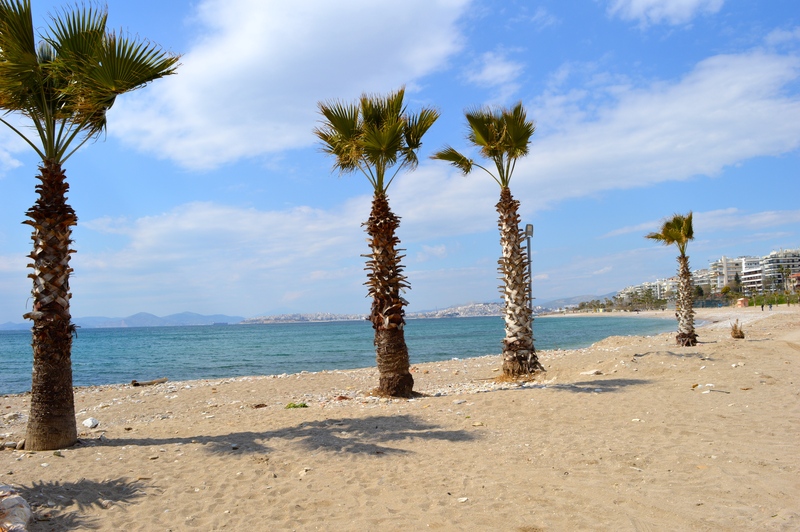 After I have strengthened myself in one of the beach-front restaurants, the trip to Voula could be continued. While sitting in the tram, pay attention to the left! 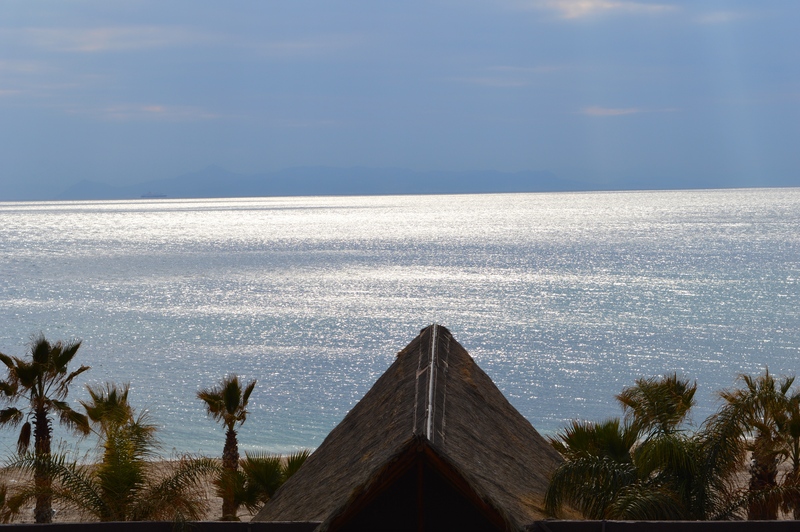 You will find huge, clean and camera surveillanced luxury villas, all with sea view, of course. The financial crisis seems to make a big circle around the south of Athens. 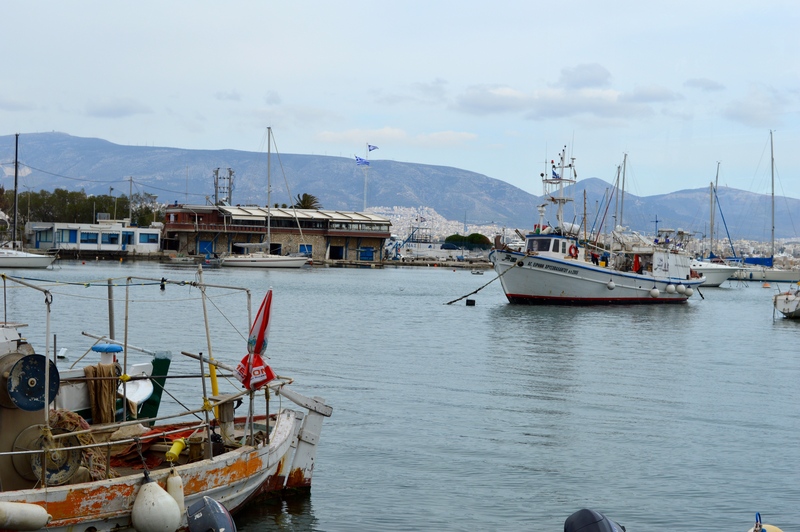 Another, very recommendable trip to the sea is Piraeus, only 10 kilometers away from Athens. 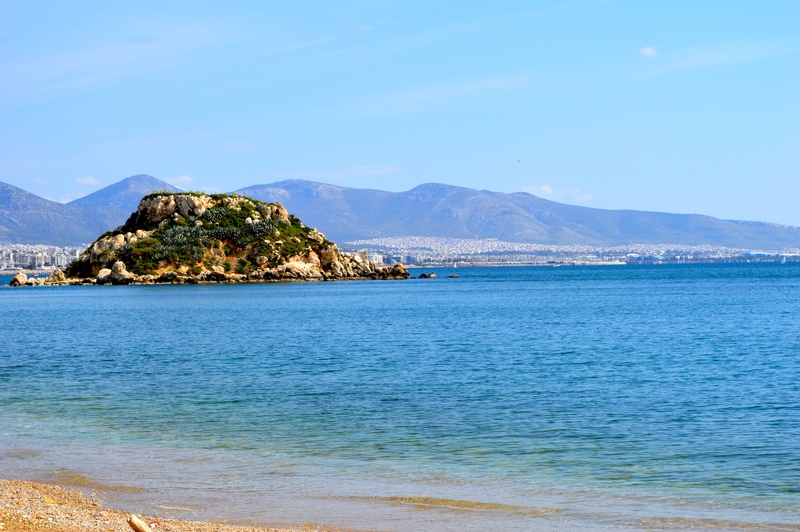 In addition to the largest passenger port in Europe, around Mikrolimano there are groomed sand/gravel beaches, which allow an easy switch off from the Athens urban jungle. If you are getting hungry at the beach, it´s the best to join a fish restaurant, of course. Exactly that happened to me and therefore I can recommend the Fish House „Botsaris“ in Mikrolimano. Fresh products and great prices, in addition with a beautiful view right at the water. Top! That’s how I reacted when I heard the name of the highest mountain in Athens for the first time. 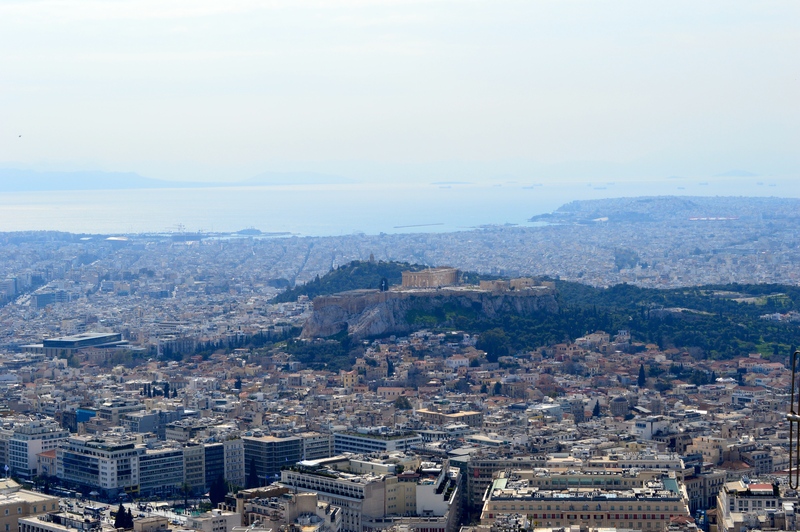 But then, when I was told that you can have an incredibly beautiful view of the city from the top of Lycabettus, it was sure that I had to get up there. From below the Acropolis is visible from everywhere. From the top, you really have to search for it. The view is truly breathtaking! 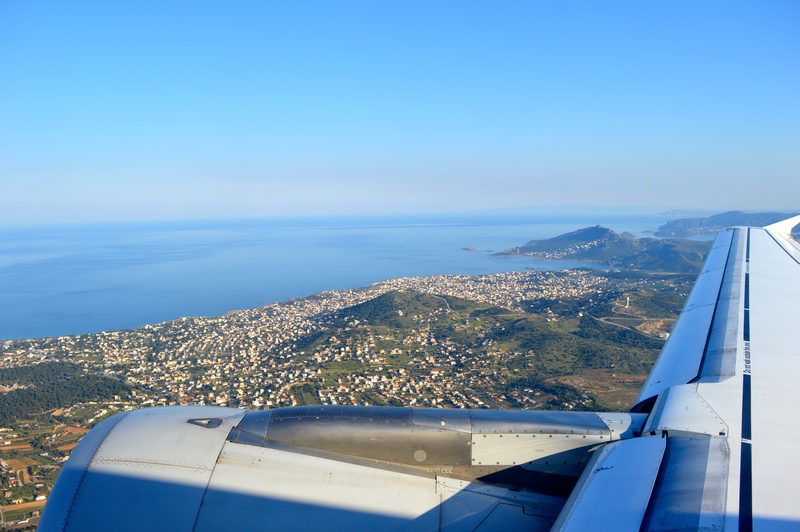 In good weather you can even take a look up to Piraeus and the nearby islands. And you can convice yourself about the amazing size of the 5-million-region only from above. So, it´s an absolute MUST! How to get there? 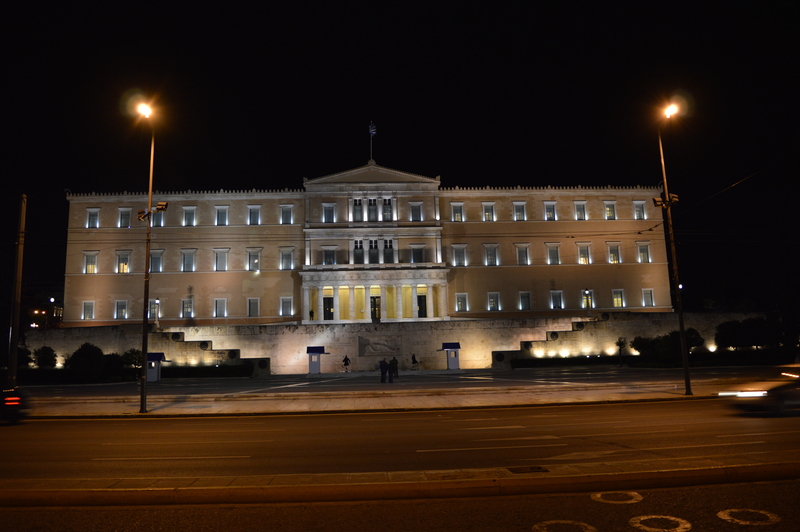 Just following the street left to the parliament in the direction to Kolonaki Square. 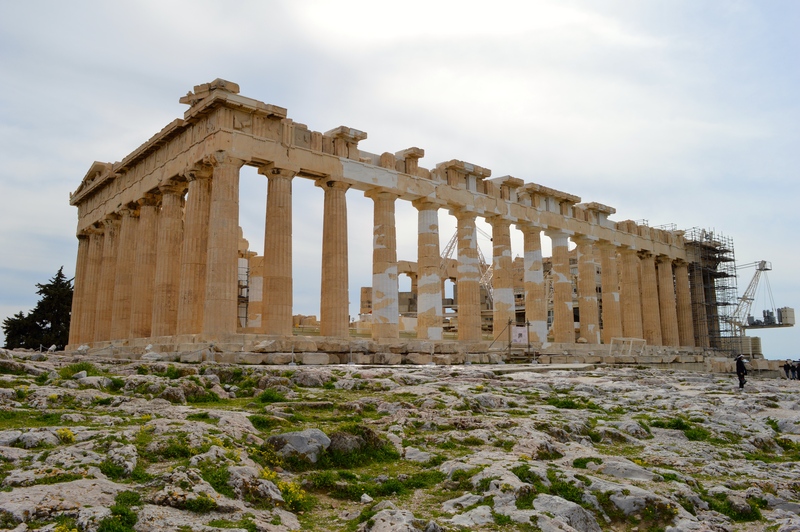 To tell the truth, I haven´t expected that Athens has so many fascinating attractions than the quite imposing Acropolis, when I booked the journey. The great market, delicious cafes and the possibility to spend a whole day at beautiful sandy beaches lets me definitely recommend to stay a few day in Athens! I spent five days there and it should´t have been a day less! 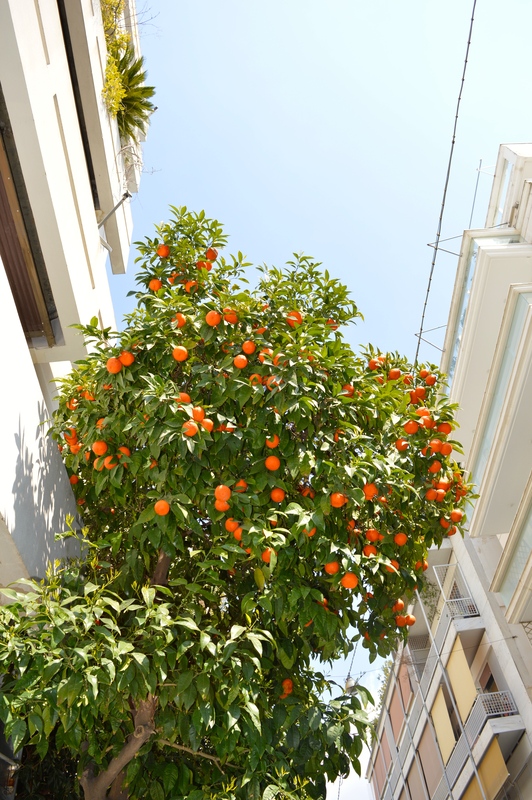 Not only the freshly squeezed juices from Monastiraki, but also the relaxing beach life in the south and the hospitality of the locals let me visit this beautiful the city once again, for sure!